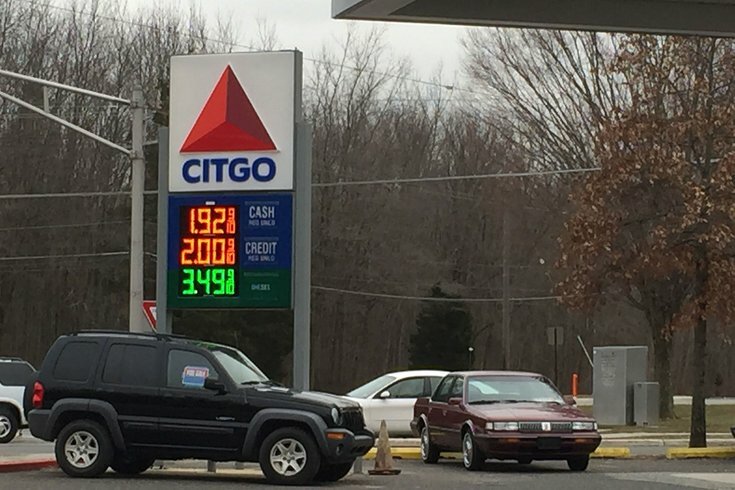 The cash price for a regular gasoline was $1.92 gallon on Wednesday, Jan. 14, 2015, at the Citgo station at 135 E. Main St. in Marlton. The last time gas prices were this low in Philadelphia, President Barack Obama had only been in office four months, health care was taking form as his chief agenda item and the nation was in the depths of a recession. Gas prices are $2.41 a gallon on average in the city, according to numbers supplied by AAA spokesperson Jana L. Tidwell. Last time they were this low was May 2009. Across the region, drivers are seeing prices as low as $1.92. The price drop follows a 100-day-old trend of declining prices as oil's value has declined by 50 percent just within the last year. She said she has another good reason for hoping the prices stay low: her teenage son will begin driving this summer. In New Jersey, gas prices are lower than they are in Philadelphia in part because of the Garden State’s lower gas tax. At the Marlton Citgo station where Monteleone was interviewed, gas was just under $1.93 a gallon. Lower gas prices are considered helpful for consumers. A Goldman Sachs economist told the Wall Street Journal in December that cutting gas prices 60 cents was the equivalent to giving Americans a $100 billion tax cut. Another consequence, in part, caused by the drop in gas prices? SUV sales are growing, according to an NPR report.